An afternoon of pampering was about to be done at fabulous Ystilo Salon in Greenhills. It's actually my first time here because I always frequent the one that's near my neighborhood. I heard so many good things about this brand that Vina Morales owns and it has been the talk of the town with celebrities, actors and actresses. I'm sure this brand only would only give the best. That's what I was about to find out. Just when I was about to get into a chair, we saw Julian Estrada. He's the grandson of the former President Joseph Estrada and consequently part of the few who made it to Star Magic Circle 2013. We had a small chat and this guy was really nice. He had that overall good vibe. He wasn't too "celebrity" if there is such a thing. He's very optimistic now that he's part of ABSCBN's pool of actors and he feels honored to have been able to be in this group. He's in the salon to get some cleaning up on his very tall hair. He tries to keep it simple and very easy to go out with. Wash and wear is probably part of his vocabulary. Men can take time with their hair of course and if it would make you look a LOT better, why not right? Senator Jinggoy Estrada must be proud of his son. He's not a spoiled brat, he's very accommodating and he knows how it is to talk to people. He's very genuine and I think he'll be really successful someday. Pretty cute, and I'm sure he'll be one guy girls would fall for... more pretty soon. See what I mean about seeing stars in Ystilo? Well you know what? There's more! Meet Alex Diaz. My first impression? He looks a lot like a young version of Xian Lim. He's very talkative. He's quite a fun chap. I bet when you're going out with this guy, you'll really have fun. He's very good looking, built quite nice too. He's also part of Star Magic 2013 and the photos he had with the pr material that has gone out doesn't do justice. He's way better looking in person. He is also very nice, you can feel that because he knows if you are probably too shy to say hi. He'll approach you most of the time haha. He's funny and I believe he could do comedy and drama in a heartbeat. These guys can probably have a better showing in a show if they are given the right break. He's got great hair already and he's in Ystilo Salon for a little cut. While I was getting my hair colored, he had his hair cut and a few strands for highlights and it was easily done. I think he even finished ahead of me. His easy and effortless style make him one of the most eagerly awaited stars in this batch. He takes time for grooming and it shows. 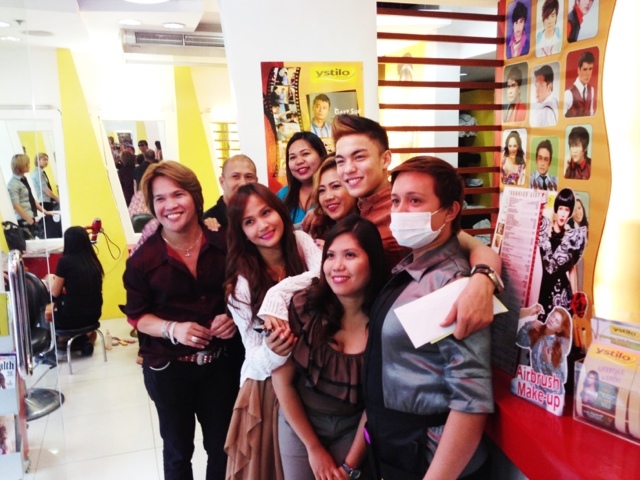 Ystilo Salon will just make it easier to have everything visualized and done exactly how you want it. As for me.. I wasn't so happy about the color they did to my hair at my other salon. So when I asked them to re-do it and have it VERY VERY LIGHT as I wanted it. They made it EXTREMELY better!